Enter the Houston rapper’s office. Maxo Kream's Persona tape doesn't lack for highly visual raps about drug dealing and villainy, but on "Out The Front Door" the Houston rapper widens his already cinematic scope, nimbly tracing a trap from humble beginnings to block-conquering status. In the video, premiering today on The FADER, Maxo and his crew chill surrounded by product and weapons and eventually rip off a buyer. 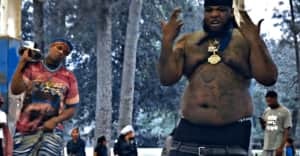 The clip was shot in Atlanta, and features Maxo and his team sporting hockey outfits. According to Maxo, they're a staple in his wardrobe. "My hockey collection is crazy crazy. I don't even know how many I have at this point. I like all kinds of jerseys except soccer jerseys because they don't make 'em for dudes built like me. Hockey jerseys are usually big-fitting so my body can breathe. Soccer jerseys would have me looking congested and confused."